Contemporary Paganism focuses on practice, often neglecting theology. Yet belief and practice are intertwined. As the religious movement continues to grow, so does the need for intellectual frameworks for practice and ways of approaching the controversial question of belief. In this book, Christine Hoff Kraemer asks central questions about the varieties of Pagan belief: Why is multiplicity so important to contemporary Pagan understanding of deities? How do Pagans experience divinity in nature? In what way can the human body be a sacred site? And what are “virtue ethics” for Pagans? With an estimated 1.2 million Pagans in the United States and significant numbers elsewhere, Seeking the Mystery is important for Pagan self-understanding and also for non-Pagans who want to understand what their Pagan neighbors believe. This short introduction to Pagan theology—or better, theologies—is a valuable primer for students and practitioners alike. As contemporary Paganism puts down its roots in the fertile soil of the 21st century, Pagans are seeking to deepen their understanding of their chosen spiritual path and to explain it to others in shared language. Seeking the Mystery is an important new book that enables Pagans and others to explain contemporary Paganism in the language of theology. It is highly recommended for both theologians and religious practitioners of all faiths. Grab a pen and start taking notes, because Seeking the Mystery is going to take you on a whirlwind course in Pagan theologies where you are guaranteed to learn something new. Pagans will find language and frameworks here to clarify their own perspectives; non-Pagans will be challenged to a deeper understanding of their own traditions through dialogue with Pagan beliefs. An indispensable guide to the myriad varieties of experience, practice and belief among modern Pagans. Kraemer deftly applies the language of theology without sacrificing the freshness and vitality of this often counter-cultural spiritual movement. I occasionally come across Pagans who think theology is a waste of time, or worse, a harmful exercise. I think those people don’t know the difference between bad theology and good theology. Bad theology is about labels and boundaries used to separate orthodoxy from heresy and thus promote conformity. Good theology is about applying the tools of reason to our beliefs and practices, not to dissect them in some hypermaterialist fashion, but to explore their meaning and implications as deeply as we possibly can, and then to clearly and precisely communicate our discoveries to others…. 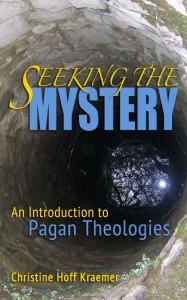 Seeking the Mystery is an introduction to good Pagan theology. For those modern pagans who are not familiar with theological jargon or technical terms (which is at least 90% of modern pagans, I suspect), this book will be an invaluable guide to these important concepts. The book is virtuous in a variety of ways, including its clarity, its utter lack of dogmatism, its comprehensiveness (especially given the limits of time and space), and also its brevity…. I would recommend it to anyone who is not familiar with basic theological terms in any religion, and to modern pagans in particular. How many times have you had to begin a conversation about Paganism by discussing what we are not?… In the introduction to her book, Christine provides an excellent framework to begin discussing what we are. Of course, she’s not the first person to do so, but hers is the first book I encountered that is not simply written as a Paganism 101 book targeted at Pagans. Plus, she is able to take things beyond the how-to instructions relating to specific spiritual technologies into the theological grounding and background for those practices. “Theology” is a word we tend to associate with Christianity, but it is available to everyone. Christine explains what theology is, and how it is accessible to Pagans: not just academic, ivory tower Pagans, but anyone who feels inclined to put in the time and effort… [Seeking the Mystery] gives some really good DIY tools to get a person thinking and exploring on their own. It also conveys a sense of how we could grow and develop as a community, how young we are in our traditions and how much scope we have to be more than we currently are. It was enriching to consider the academic and practical meanings behind soft and hard polytheism, animism, monism, and many other “isms” which describe modern Pagan practice. As a member of a faith without much dogma or instruction, sometimes the simple power of being able to articulately name your experience can be enlightening, and Kraemer provides as many varied terms and definitions as she can in this book. While Seeking the Mystery is in no way a deep, comprehensive study of every component of modern Paganism, it offers an excellent overview that is easy to read and understand while at the same time not over-simplifying the material.